One QWIKTIE® Tie Rod Assembly. Universal Application. The all-new QWIKTIE tie rod assembly adjusts to fit over 80% of straight tie rod assembly lengths and styles, reducing overhead stocking costs for dealers/distributors and eliminating the need to improvise repairs while waiting for a part to arrive. QWIKTIE assemblies also feature finer threads for increased precision and accuracy in alignment adjustment, and their heavy-duty construction and strength allow them to hold alignment longer and reduce stress on other components. QWIKTIE’s versatile range of adjustment makes it a flexible stock addition. QWIKTIE tie rod assemblies are highly adjustable to fit over 80% of the straight tie rod lengths and styles in the market. QWIKTIE features easy color attributes for identification and accurate installation. Patent Pending. 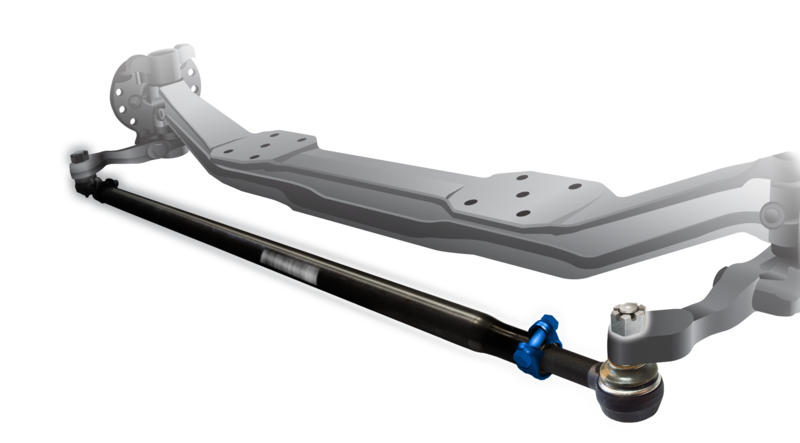 With a versatile tie rod solution, QWIKTIE tie rod assemblies reduce overhead for maximum efficiency. QWIKTIE fits from 57 3/8” to 73 7/8” total length from grease zerk to zerk. Increased strength certifies the ability to hold the alignment longer, reducing stress on other suspension components providing increased fuel and tire mileage. QWIKTIE assemblies are heavy duty with a thicker and stronger cross-tube material for demanding loads. Finer threads provide more precise adjustment and increased strength to hold the alignment longer reducing stress on the steering system. Threads are pre-lubricated for ease of installation and easy adjustment over time. Alignment settings secured with time saving precision achieve a safe, secure connection between the tie rod and threaded tie rod end. For more information on the QWIKTIE tie rod assembly, contact a STEMCO sales representative or find your nearest STEMCO distributor.